As a DJ, producer, remixer, promoter and label owner Tim has his fingers in many different pies and the launch of What Happens was a natural progression. “It is set up as a place to unite the music with related activities and a place to create and develop new ideas and talents”. Musically What Happens focuses on quality underground house music and quickly picked up support from the who’s who of the scene. 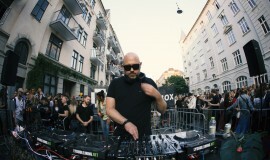 Alongside the releases the WH family are deeply involved in the clubbing scene, running monthly nights in the Danish capital as well as domestic and international tourdates across Europe. That’s What Happens. Please send a private Soundcloud link to info@whathappens.dk . We are always curious to hear your music and will listen to all the demos we receive but due to the number of emails we receive, we will only get back to you if we like what you do. If you’re interested in booking one of our DJs/artists, please send your request to info@whathappens.dk with info (date, venue, budget, etc.) and our team will get back to you. We have been hosts of WH tour nights at venues in Ibiza, London, Oslo etc. We provide DJs from our own roster and also have some of the biggest DJs in the world playing for us regularly. Please get in touch for further details. For general enquiries, distribution, licensing or event information, please use this contact form to get in touch.